These Oven Bacon Wrapped Asparagus bundles are easy and quick to assemble. They are brushed with a simple yet delicious honey mustard glaze making them the hit of your dinner party. Well the Christmas holidays are almost upon us and I still have so much to do. I am so behind this year. I have not purchased one single gift yet. The kids came down with a virus a couple of weeks ago and my son is still fighting it. He was home with me all day and when I called the school to let them know they told me that almost half of his class was out sick. I sure hope we can beat this before the holidays come rolling in here. 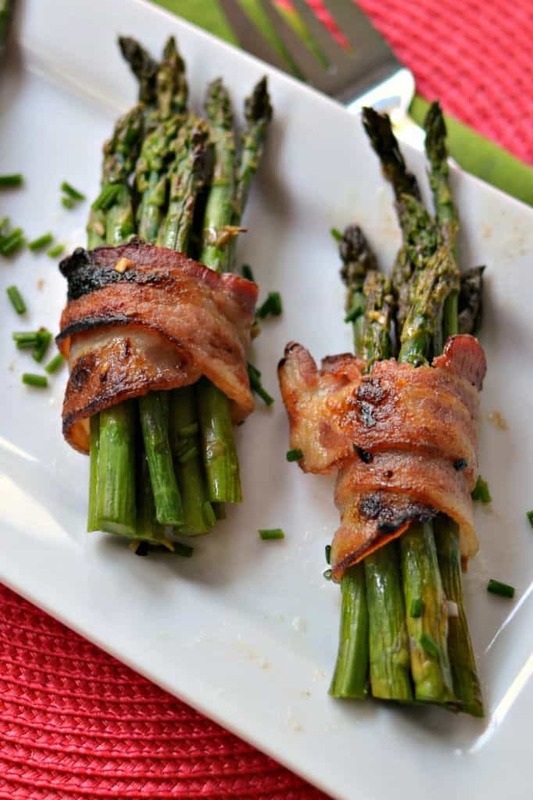 If you are chasing your tail and wondering how in the world you are ever to going to catch up then you must put these easy Oven Bacon Wrapped Asparagus on your menu. They would be perfect for your big Christmas dinner or even for your Saturday evening grilled steak and baked potatoes. I am a huge asparagus fan! HUGE! Don’t worry if you could just take it or leave it. As my hubby says that is the best way to eat asparagus…..yummy! How to make Oven Bacon Wrapped Asparagus. Divide trimmed and washed asparagus into four equal bundles. Wrap each bundle with one slice of bacon and place on cookie sheet seam side down. In small bowl combine red wine vinegar, Dijon mustard, honey, garlic, chives and pepper. Whisk in olive oil. Divide mixture in half and brush the bundles with half the mixture. Place on cookie sheets and bake for fifteen to twenty minutes placing under the broiler for the last minute of cooking. Brush with remaining mustard vinaigrette. How to properly store asparagus. Asparagus dries out quickly so when brought home from the store the stalks should be placed in a Ziploc bag with a half cup of cool water stalks head side up. Wedge it in the refrigerator so the the bag is standing up. I usually wedge it in the door with the mustard and ketchup. The water should be changed daily. I have had many readers tell me that they do not purchase asparagus anymore because it is tough. This is due to it drying out. Make sure you re-hydrate your asparagus as your grocer is probably not storing it correctly. Bacon Wrapped Asparagus brings fresh asparagus, crispy bacon and a quick homemade mustard vinaigrette together in perfect harmony. When you make the mustard vinaigrette split it and put half of it in a separate bowl to serve with the bundles. Use the other half for basting. This easy recipe preps in about ten minutes and cooks in less than fifteen minutes. You can make the vinaigrette ahead of time and store in the fridge in an airtight container. 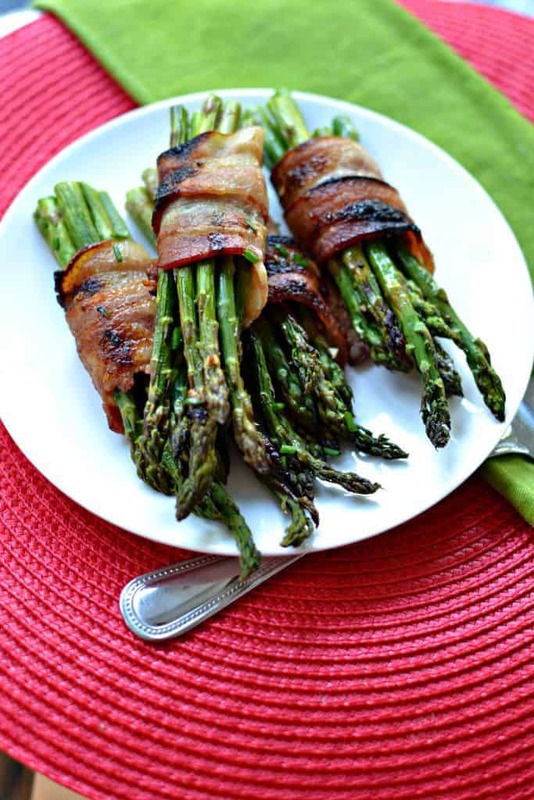 These delicious Oven Bacon Wrapped Asparagus make the perfect side for any meal. Other asparagus recipes you will love! This post was originally published December 10, 2017 and was republished October 18, 2018 with new content. Wash and trim asparagus; removing the tough lower portion of the stem. (You will need to split out the asparagus into four equal bundles). 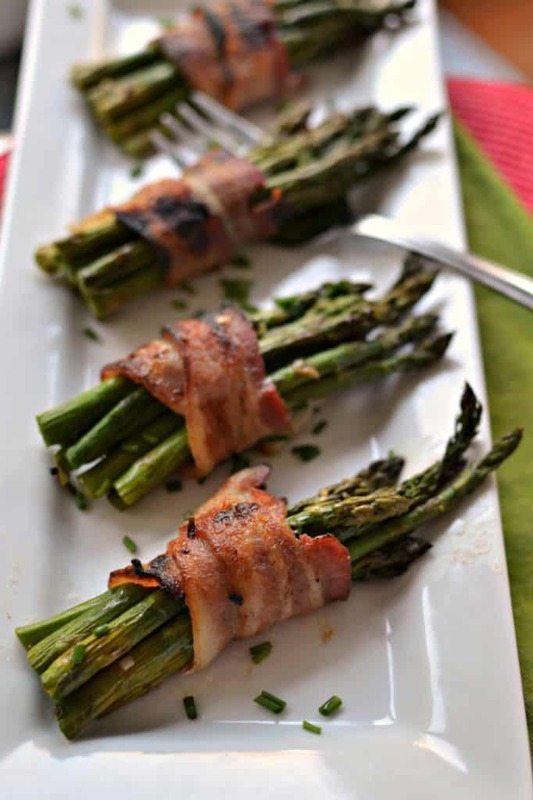 Wrap one slice of bacon around 5-6 spears of asparagus and place on baking sheet. In small bowl combine red wine vinegar, Dijon mustard, honey, garlic, chives and pepper. Whisk in olive oil. Pour half of the mustard vinaigrette into a separate bowl and set aside. Take remaining vinaigrette and using basting brush baste asparagus bundles. Place cookie sheet in oven and bake for 15-20 minutes. Turn broiler on to brown the bacon the last 1-2 minutes of cooking. Stay close by as I have always found broilers unpredictable. 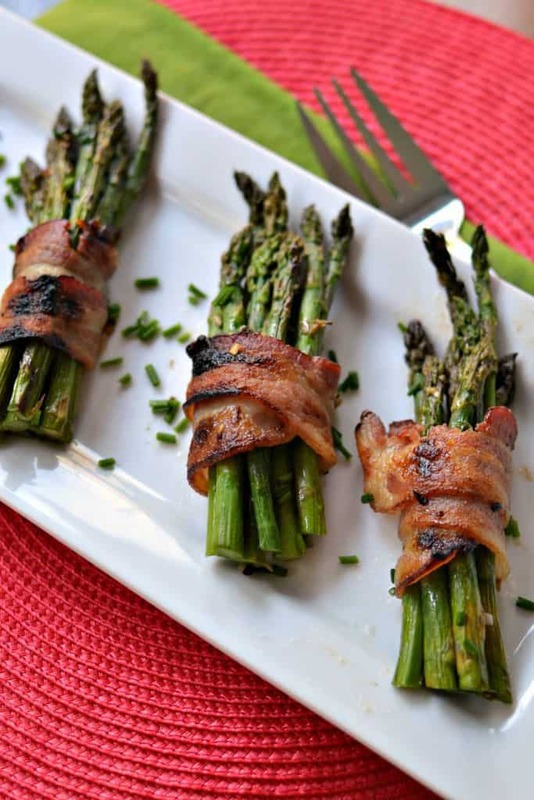 Serve remaining honey mustard vinaigrette with asparagus bacon bundles. Perfect! Thanks for the easy to prepare recipe! ?